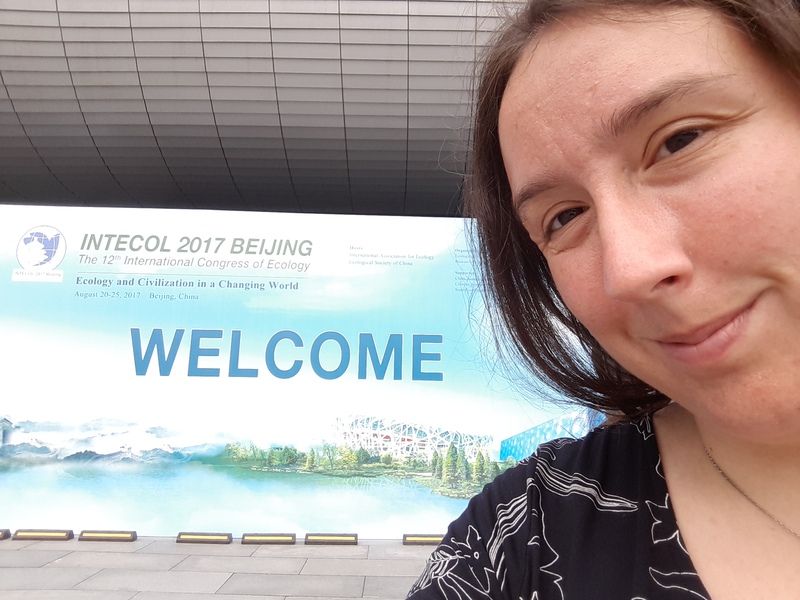 This August I attended the International Congress of Ecology (INTECOL), which took place in Beijing. This meeting is the 12th since its inception and the first to be held in China. Over 2,400 delegates from around the world gathered at the China National Convention Centre for a packed program running over five days. The theme was Ecology and Civilization in a Changing World, encompassing subjects ranging from ecohydrology to species restoration across 17 concurrent sessions. China has seen rapid development over the recent decades, including urbanization and agriculture, which have also resulted in great environmental pressures. These concerns were succinctly summarized by Professor Liu Shirong, President of the Ecological Society of Ecology, in his keynote speech. Professor Shirong also outlined the science being undertaken to address these concerns. Whilst addressing domestic environmental concerns and engaging with policy making, researchers in China has been generating great volumes of data and advancing knowledge across a broad range of ecological fields. One of the most fascinating parts of this conference was learning more about research in China, as well as meeting many young scientists (over 1000 students attended, many of whom were from Chinese institutes). Each day began with excellent keynote speeches. Gretchen Daily of Stanford University discussed the difficulties in valuing ecosystem services, including more nebulous facets such as mental well-being. Bill Sutherland of the University of Cambridge discussed customized evidence synthesis as a means to find solutions to local problems, and calls for potential collaborators in this ongoing project, and the problem of evidence complacency (as discussed by Sutherland & Wordley in a recent article in Nature Ecology and Evolution). William Bond of the University of Cape Town stressed that natural grasslands, such as the Fynbos, are under numerous threats, including well-meaning afforestation efforts. James Clark of Duke University discussed the use of models in predicting community responses to climate change, whilst Chansheng He from Western Michigan University emphasized the importance of interdisciplinary watershed science to tackle the global water crisis. One of the difficulties in a meeting such as this is deciding which presentations to attend. This is particularly true when you are an editor interested in the human-ecology interface, given the theme was Ecology and Civilization in a Changing World! Whilst this meant I missed what were certainly great talks, I had the opportunity to attend some incredibly interesting sessions. I attended sessions on topics including modelling and phylogenetics in wildfire ecology, demographics, species distribution modelling, ecohydrology, and habitat restoration. One emerging theme from the conference was collaboration. This theme was succinctly put in Bas Ibelings’s plenary speech, during which he mentioned an African proverb that I had not heard before; “If you want to go fast, go alone. If you want to go far, go together”. The increasing connectivity of the scientific community has seen an explosion is fruitful collaborations over recent decades, and people are reaching out across the global to come together and address key concerns in the modern world. Collaboration requires dedication and can be hard work, but a diverse array of people and the synthesis of data can yield fantastic insights. And congresses such as INTECOL are valuable to drawing people together in a mutual wish to address questions that need answers. At the conference’s close, it was announced that the next INTECOL meeting will be in Geneva, Switzerland, in 2021. I hope to see many of you there! Very interesting summary. Sounds like a great conference!